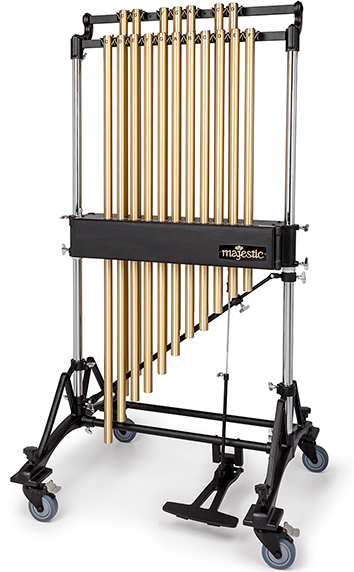 Majestic C8622B Professional Series chimes feature a 22 note range of 1.5" brass lacquered tubes for high quality tone and projection. An enclosed damper box ensures unhindered performance of the mechanism, while adjustable wheels allow instrument leveling to facilitate free resonance of the tubes. Majestic C8622C Professional Series chimes feature a 22 note range of 1.5" chrome plated tubes for high quality tone and projection. An enclosed damper box ensures unhindered performance of the mechanism, while adjustable wheels allow instrument leveling to facilitate free resonance of the tubes. 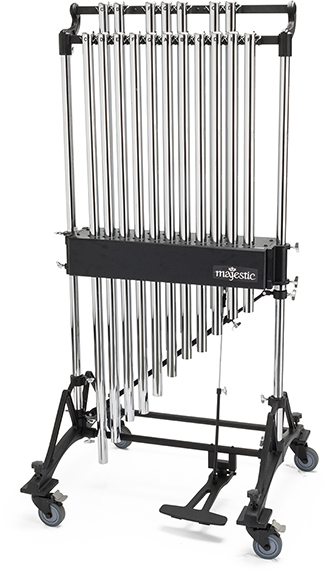 Majestic C6618B Deluxe chimes feature a 18 note range of 1.5" brass lacquered tubes for high quality tone and projection. An enclosed damper box ensures unhindered performance of the mechanism, while adjustable wheels allow instrument leveling to facilitate free resonance of the tubes. 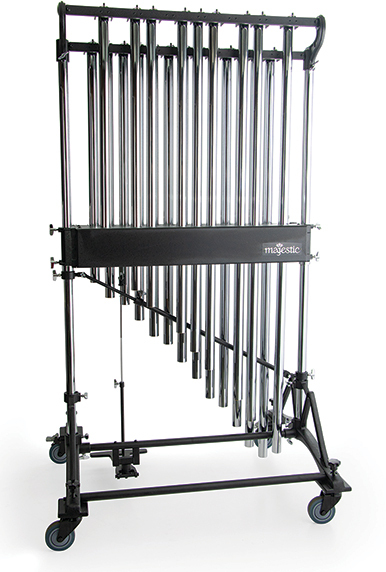 Majestic C6618C Deluxe chimes feature a 18 note range of 1.5" chrome plated tubes for high quality tone and projection. An enclosed damper box ensures unhindered performance of the mechanism, while adjustable wheels allow instrument leveling to facilitate free resonance of the tubes. Majestic C1618B Quantum chimes feature a 18 note range of 1.5" brass lacquered tubes for high quality tone and projection. An enclosed damper box ensures unhindered performance of the mechanism, while 8" tires and a wide wheelbase make it a free rolling choice for outdoor use. Majestic C1618C Quantum chimes feature a 18 note range of 1.5" chrome plated tubes for high quality tone and projection. An enclosed damper box ensures unhindered performance of the mechanism, while 8" tires and a wide wheelbase make it a free rolling choice for outdoor use. 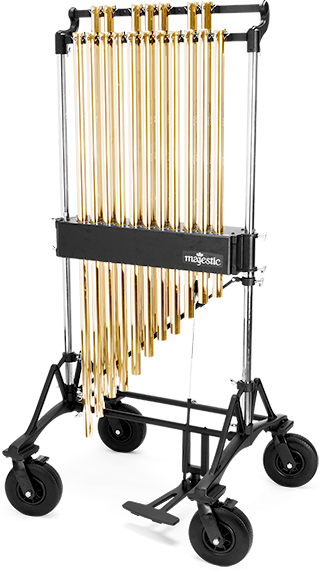 Majestic C6518B Deluxe chimes feature a 18 note range of 1.25" brass lacquered tubes for reduced weight and affordability. An enclosed damper box ensures unhindered performance of the mechanism, while adjustable wheels allow instrument leveling to facilitate free resonance of the tubes. Majestic C1518B Quantum chimes feature a 18 note range of 1.25" brass lacquered tubes for reduced weight and affordability. An enclosed damper box ensures unhindered performance of the mechanism, while 8" tires and a wide wheelbase make it a free rolling choice for outdoor use.